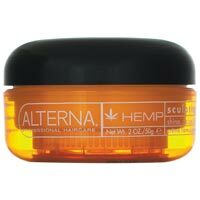 Alterna Hemp Sculpting Putty is infused with ultra-hydrating hemp seed oil, Alterna's Hemp Styling products protect and strengthen hair while addressing an array of styling needs. A pliable putty designed to sculpt, define and shape while providing a flexible, medium hold with superior shine. Benefits: Contains organic conditioning agents which help to heal the hair. The fibrous texture helps to build structure in the hair. Creates extreme texture or added control. Delivers a flexible high shine finish. Directions For Use: Apply the desired quantity to the hands and run through wet or dry hair. Style as usual, with or without heat. A perfect gift to give all year long to a loved one, pick some up today!